Here we have a somewhat edited contribution from Editorial0, who has taken a look at an older game to see where it went wrong… Personally, I must agree in general with many of his points: no doubt the Brave New World RPG has some strong adherents, and it certainly had it’s interesting and innovative points – but I think it says something that none of the players we tried to get interested in the game wanted to bother with it past character generation and a few small experiments. Moreover, it went out of print fairly quickly and – in the ten years that it’s been out, – has only gotten one review on Amazon.Com (while the old books for sale are numerous and cheap). The RPGnet ratings seem to agree. It simply didn’t attract enough support to survive. 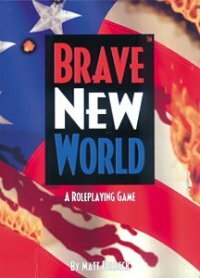 Brave New World was a very unusual game from Pinnacle Entertainment and AEG back in 1999-2000. With a distinct but interesting setting and a decent basic system, you’d think it would have worked very well. It didn’t. Though it sold well enough to spawn a number of sourcebooks, the game never got much attention and quickly vanished. In some ways it’s a shame, because it’s not at all a bad game. However, the creators didn’t fully think out the game. It fell into an uncomfortable market niche, and it simply couldn’t survive. Ultimately, that’s because it had a mediocre superpowers system, which as you guess is a pretty flagrant foul-up for a superhero game. So without further adieu, let us explore… a Brave New World. Among Brave New World’s strengths is its very distinctive world. In a gaming market where Champions has endless comic-book rip-offs and Mutants and Masterminds is basically the same but d20, Brave new World offered a very different setting. America had been taken over by an evil shapeshifting copy of John F. Kennedy, Ronald Reagan ran the obnoxious superpowered police while planning to oust him, and Congress and the Judiciary were mere puppets. Oh, and Atlanta and San Francisco had been nuked, the world’s closest thing to Captain America was an ex-military, ex-assassin who used to work for said super-police before joining the mob and then the rebellion, and every other place on the planet was thick with even more tyranny and injustice. If America was a quasi-police state (but with a lot of guns and freedoms for some reason), whole nations had become giant Gulags. As far as settings go, there are worse. Almost anything you do as a character will make the world a better place. There’s plenty of opposition to suit everybody, and there are so many factions running around you can hardly blink without walking into somebody’s scheme. Said evil copy of JFK is running the government while the FBI, military, CIA, and Delta Prime (super-police) have their own interests. On top of that, you have giant corporations who hire out superheroes, mafia dons running their syndicates, the weird Bond-villain organization Evil unlimited, and multiple “heroic” groups. That’s a lot to handle. Places where good people are essentially nonexistent are about as much fun in games as they are in real life. The entire game setting sounds like they took one of the stupidest ideas from Marvel (the long-running Mutant Registration Act story and how it inevitably turns everything into a fascist tyranny) and tried to make a whole setting out of it. It wasn’t that interesting in the comics. Lest anyone blame me for “spoiling” the secrets, I should point out they weren’t that secret, since they were printed in the basic book. AEG had an odd habit of putting in important game background information in the backs of their books and pretending people wouldn’t actually read the book they’d just bought. But let’s step beyond that. Sure, it’s a flawed setting, but it is at least interesting. How does the game system stack up? At first glance it’s pretty solid. It’s simple, clear, and small differences are important enough to matter and abstract enough that you can rename them to suit. You have four attributes, and each is useful with a wide selection of skills. Skill checks fall to the simple “Roll attribute, keep the best die, add the skill value” system. There’s a good selection of standard skills, and each one is useful enough that you may find stretching those points very tempting. The edges and flaws are simple to use, easy to understand, and fit fairly well. The only basic flaw is that it feels bland and over-simplified. While you’d have to try hard to make a bad character, there’s not a lot of flexibility and characters tend to come out awfully similar. Quite often, everyone in the party will have similar attributes and skills simply because there’s not much variation in the system. It’s not ideal, but the overall effect remains functional. It’s in the superhero system where things fall down, and sadly that’s a critical flaw in a superheroic setting. First, the superpowered packages are underwhelming. Think “very young X-Men on a bad day” rather than “Justice League”. Since the nature of the system doesn’t let you drain points from one category to pick something else, you can’t have a skills master while somebody else is super-strong and fast and a third character flies around shooting bolts of energy. Everyone has the same skills, and the packages are unusually pre-written and very specific. You can fly, or be super-strong, or be fast, or be agile, or shoot lasers. In what is probably not helpful, you can also be a gadgeteer or a “Bargainer” and do any of the above and then some. Gadgeteers can fly around in powered armor with mounted machine guns, thus playing Iron Man (and have other gadgets available, too) when the next person over is playing Wolverine’s dim-witted, clawless cousin by comparison. Bargainers can eventually build a selection of totems which let them mimic anybody’s powers, and got an entire sourcebook of their own to boot. I don’t usually worry too much about game balance. Fun is much more important. But Brave New World insisted on writing packages which were immediately obsolete or at least nigh-useless compared to other packages the next page over. There’re were so few trade-offs that you’d be crazy to take one of the less-interesting powersets. For example, there are few advantages to playing a Sneak, which got only bonuses to stealth, if you could shrink down and get very good bonuses to stealth along with bonuses to all kinds of other stuff as well and fit into places a Sneak couldn’t. Sure, the Sneak was better at it, but that didn’t really matter because you could still achieve all you ever needed with a Shrinker and do much more besides. But mostly, the problem was simply that the packages were much too specific and in the basic book they only had a handful. Superheroic games tend to attract a lot of creativity and flair, and this game seemed bound and determined to knee-cap any of that fun before it began. it didn’t help matters that the existing packages weren’t all that great anyway. Let me explain. Energy blast powers are pretty good in the setting. They’re weapons you can take anywhere, make you a little tougher, and they’re pretty good for what they do. Guns are also pretty dangerous, and body armor definitely takes most of the lethality out for both – though a lucky shot could still kill a weak character. The problem here is that guns compare very well – too well, in fact. Sure, the superpowers are a little better, but that’s not much comfort when the gun is disposable when you need to do so, easily carried (people commonly go armed in case of superhero battles), and doesn’t attract the attention of the evil super-police! They have ways of testing for super-powers, after all. A character with no powers is almost as effective in combat as most supers, can easily take advantages to become nearly super-human himself, and is a lot less likely to get executed or sent to prison for life. Who wants to play a superhero who’s probably not as effective as a skilled, well-trained soldier? Yes, Seals and Rangers are exceptional people, but in this setting they can get more or less everything you can, and carry better weaponry than your combat specialists beside! After a trial session, everyone I know looked through the book and at least strongly considered that a powerless character would be more fun and less hassle than playing a superhero. And that’s not a good sign for a superhero setting. This isn’t to say it’s all bad. You can add little tricks on a skill check, or with your superpowers, and these can be fun. They’re supposed to be the moments when you unleash your “true power” and suddenly turn the battle around. The problem is that you have to buy them ahead of time, get to toss one on when you happen to get a good roll rather than when you really need them, and they often don’t do much. As the setting expanded, these perks also expanded into confusing situations. If the use of your power is such that you have to try for a trick ahead of time, but don’t get it, can you try again every turn? Does it not function at all? The setting stays vague on the matter and the written rules contradict the strong implication of how the abilities actually work. While Tricks initially had a specific mechanic for activation, they just ignored that and dropped them in to cover all kinds of situations. Again, I don’t mind them dong that – but if they write a rule it needs to stay consistent. Otherwise, don’t bother. Meanwhile, you get the odd “Delta Point” which supposedly can be spent to improve an upcoming important roll. However, the random factor tends to make this either unnecessary (and therefore wasted) or useless. You’re better off saving them in case you take potentially-lethal damage than spending them at dramatic moments. Unlike classic d6 Star Wars, you don’t get rewarded for using them when it’s the most fun, but when it’s the most practical. The system overall reminds me of Deadlands, not a great surprise. But Deadlands matched the system, the backstory, and the character options very well. You really could do the things legendary character could, if you were lucky or smart or skilled. You could be your favorite western hero, or a crazed Steampunk tinkerer. In Brave New World, you can only pretend to be a superhero. You can play a pulp hero – but pulp heroes rarely had any actual “powers” beyond two good fists and perhaps a fast car or unusual gun. End of the day, there’s really nothing here that other systems don’t do better, a common symptom of bad games. If you want flexibility, you play Champions. If you want convenience, Mutants and Masterminds. If you want to get going fast, Marvel Superheroes. Brave New World simply has nothing on any of them. It wasn’t a bad game in any sense of the world, but the design was flawed from the beginning. I liked the setting but a player was shoehorned into choosing from a limited and select set of powers and that is not what players want. Players want a wide choice of options, to create their imagination, not play someone else’s imagination. It felt like the GM (book designer) was making a character and handing it to the players saying “here play this”, instead of a player creating a character. Also the rules slightly annoyed me. They present a set of rules and then a pack of optional rules. I personally hate that. Give me one set of rules, even if its a bit long. Oh yes – and with that lack, players who wanted to make up their own packages (such as a “dimensional travel” package) were left with virtually no guidance – and there wasn’t enough information on the cosmology, or how anything was supposed to work, to make any rulings on such things. Thus everyone went back to Champions. Forgot to mention that it had two publishers because AEG bought the game line. The metaplot is actually much stupider than it sounds, as the eventual “big reveal” was that humans are all descended from Gods and monsters and angels or whatnot, but aliens cahsed them away. Eventually said aliens showed up and told the evil President that he had to get rid of them or they’d soon wreck up the dimension. Fortunately, that never got published.